Born and raised in the Piedmont region of North Carolina, Cole developed a passion for short stories and poetry at a very young age. This enthusiasm for storytelling transformed and evolved into visual expression throughout high school and college with photography, fine art and music. 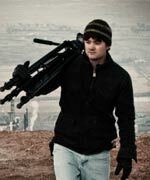 Upon graduating from NC State University with a Bachelor of Arts degree, Cole moved to Ventura, California to study filmmaking and journalism at Brooks Institute. His innate need to explore and share the uncommon or overlooked aspects of humanity drives the majority of Cole’s work.